*Guest Room Rates - single & double occupancy (subject to change, rate does not reflect 8% tax.) Add $10 per person per night for more than two people. *Check-in is between 3 pm and 8pm, unless other arrangements are made at the time of reservation. *Check-out is before 11am, unless other arrangements are made at the time of reservation. Private bath w/shower. Queen-size bed. Max. occupancy - 2 $84 Click picture to see bigger picture of room. Private bath w/shower. King-size bed. Max. occupancy - 2 $84 Click picture to see bigger picture of room. Private bath w/shower. King-size bed and 2 twin size beds. (The twin / trundle beds are for children. Not full size adults.) Max. occupancy - 4 $84 for one or two people. Click picture to see bigger picture of room. # 4 THE MAID OF IOWA ROOM is named for one of the first steamboats plying the Des Moines river in the 1800’s. It would stop at Benton's Port for the night and the travelers would stay over in the Ashland House (as the Mason House was known then). The room is decorated with prints and paintings of steamboats. Your private bath, with shower, is just 3 steps into the hallway. Extra-long Double bed and 1 twin size bed - (150lb weight limit for the twin bed). Max. occupancy - 3 $74 for one or two people. Click picture for bigger picture of room. 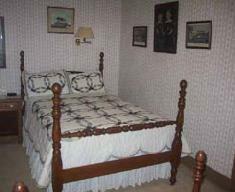 # 5 THE MASON SUITE was the bedroom of Mr. and Mrs. Lewis Mason. The furnishings include a three-piece hand carved walnut set with a seven-foot sleigh bed and dresser; nine-foot tall pier mirror and an 1873 “Evening Star” stove with foot warmer. Two twin beds in an adjoining room make it perfect for families. Four windows enjoy a lovely view of the Des Moines river. Private bath w/shower. 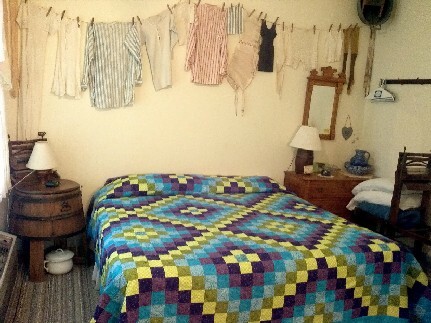 Extra-long Double bed and 2 twin size beds. 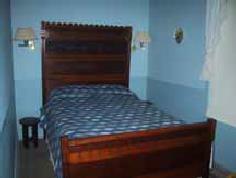 (The twin size trundle beds are for children, or small adult. 150lb. weight limit.) Max. occupancy - 4 $89 for one or two people. Click picture for bigger picture of room. # 6 THE DES MOINES SUITE overlooks the river, the old iron bridge, and the village of Bentonsport. 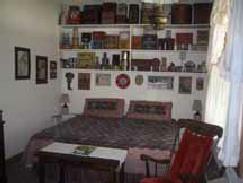 Senator Thomas Hart Benton liked to stay in this room when he was in town. This was also the childhood room of William E. Mason, later elected to the U.S. Senate from Illinois. Private bath w/shower. Queen-size bed and 2 twin size beds. (The twin / trundle beds are for children, or small adult. 150lb. weight limit.) Max. occupancy - 4 $84 for one or two people. Click picture to see bigger picture of room. Private bath w/shower. Queen-size bed and 1 twin size bed. For child or small adult, 150lb. weight limit. Max. occupancy - 3 $84 for one or two people. Click picture to see larger picture of room. 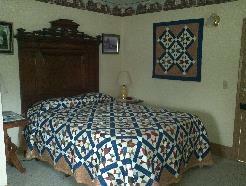 # 8 THE ASHLAND ROOM is named for the original name of the house when it was built in 1846. When the Mason family bought the inn in 1857, they changed the name from the Ashland House to the Phoenix Hotel and then the Mason House Inn. 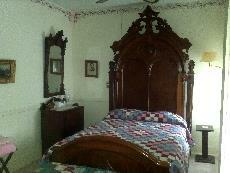 It has a hand carved "carpenter's apprentice sampler" head and foot board made of red elm. Private bath w/shower. Extra-long Double bed and twin-size sofa bed for a child or small adult. (150 lb. weight limit.) Max. occupancy - 3 $74 for one or two people. Click picture to see larger picture of room. #9 THE CABOOSE COTTAGE Yes, it is a real caboose to rent for a night, weekend, a week or longer! The only RS&P caboose in Iowa. It has a kitchen, dining area, bedroom, heating and air-conditioning, satellite TV, computer port, and bath w/shower, and includes breakfast in the main house. Queen-size bed in the bedroom. 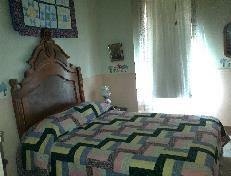 And 3/4 size bed in the dining area fits one small adult or two children. Max. occupancy - 2 to 4. $105 for one or two people. 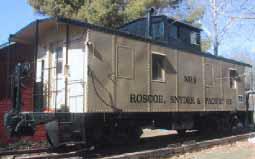 Click picture to see larger picture of caboose and inside views. Choo-Choo! All Aboard! 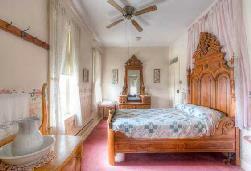 *All rooms have private bathroom with shower, individual heat and A/C. *Rates are for single & double occupancy. *Add $10 for each additional person, per night. *Taxes not reflected in rate. *A credit card number is required to secure a reservation. *Full refund upon 7 days notice (14 days notice required on special weekend events), or if we are able to re-rent the room. *If you cancel on the day of your reservation, you will be charged a $25 cancellation fee. *Reservations must be secured by Visa, Discover, or MasterCard, or you can mail us a check for the total amount. *Payment with check or cash is preferred upon checking in, but we also take Visa, MasterCard, and Discover credit and debit cards. *Check-in between 3 p.m. and 8 p.m. Check-out before 11 a.m. If other hours are needed, please inform the Innkeepers as you make your reservation. If you are going to arrive before 3 p.m. or after 8 p.m., please inform the Innkeepers at the time you make your reservation. *We do not have a liquor license. If you want to bring your own alcoholic beverage, please limit it to the equivalent of one bottle of wine. All consumers must be over 21. *A Quiet Time noise restriction is in place from 10 p.m. to 6 a.m. This includes adults, children, and DVD players. *Well behaved children are welcome, if they are comfortable around antique furnishings, and if their parents are comfortable with them around antiques. Anything broken will be charged to you. *No pets please. We do have cats and chickens on the premises. *We will be glad to furnish your group a special rate of 5% off, when four or more rooms are reserved and when payment is made with check or cash. The group rate is also available if one room is rented for 4 or more nights in a row. No discounts with credit cards. *Any IPTV discounts must be approved at the time of reservation and are good for Sunday - Thursday only. Payment with Cash or Check. No discounts with credit or debit cards. Discounts not given on festival weekends. **Since this is our home, and you are a guest in our home, we reserve the right to not accept guests at our discretion. We reserve the right to call the sheriff to remove any unpleasant guests.